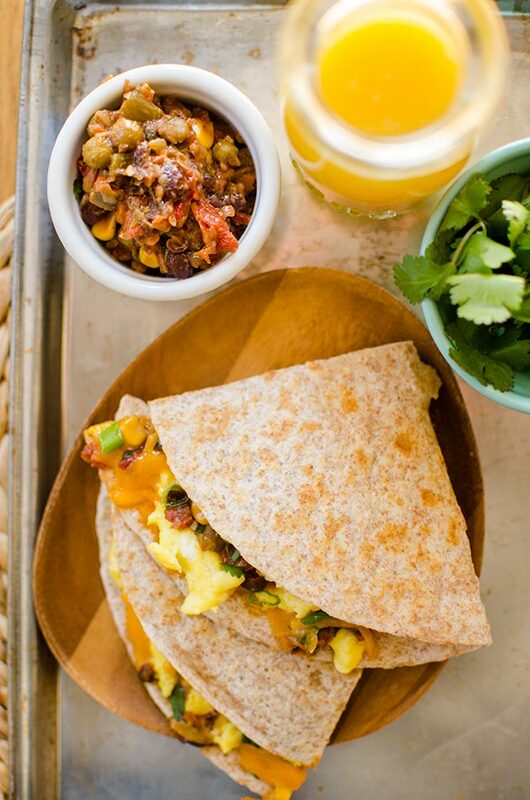 Try this quick Mexican-inspired breakfast quesadilla recipe made with eggs, cheddar cheese and cilantro. They say that breakfast is the most important meal of the day, but somehow, I find that I spend the least amount of time on it. That’s why the breakfast recipes I have in my arsenal are quick and healthy but also pack a serious punch of flavour. Breakfast quesadillas are one of those breakfasts that may seem complicated, but if you work it into your morning routine, they can take less than 10 minutes. If I can make myself a quesadilla at 5am before I head to work, then I truly believe that you can too! And I’m not going to lie, there are definitely days where I pack up this egg and cheese quesadilla in a re-sealable bag and take it to go. 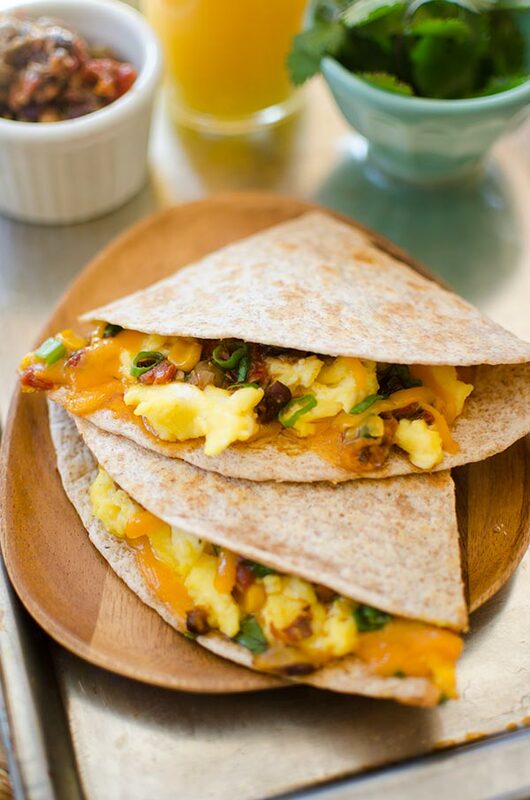 Breakfast quesadillas start with three basic ingredients: tortillas, eggs and cheese. Once you’ve got those down, it’s up to you to add your own twist to them. This recipe has a Mexican twist because I’m using Black Bean Miscela as the ‘secret ingredient’ (I’ve also added a sprinkling of cilantro). 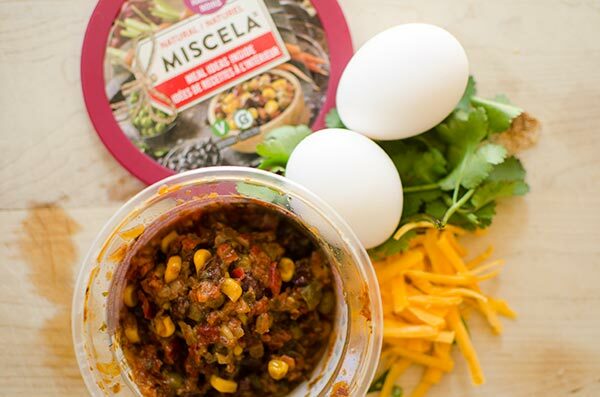 This is a flavourful mixture (fun fact, Miscela literally means “mixture” in Italian) of black beans, corn, peas and carrots with a blend of spices. I like that it’s a quick and easy way to enhance a typical quesadilla and brings a hint of sweetness and tang. If you know me, you probably already know that I’m into local foods and products whenever it’s possible. Being surrounded by cooks (who I now count as friends) at my old job was what got me started on the hyper-local train. One day, a friend of mine brought in some ramps she had foraged and my life was changed. Ever since, I’ve found myself searching out local produce and products. Something that I can get behind is a Canadian company and Derlea Brand Foods (the company behind Miscela) has humble roots in Markham, Ontario and now operate out of Durham–talk about local! This humble breakfast quesadilla gets a gourmand-worthy upgrade by using ingredients and flavours that take it to the next level. You could definitely add some sausage, chicken or chorizo into here if you wanted to add some meat or enjoy this quesadilla for lunch or a quick dinner. Step 1: Scramble two eggs in a hint of canola oil–I’m using canola oil here because it’s a neutral oil. Once your eggs are cooked, set them aside, and place your tortilla in the hot pan. I like to use one tortilla per quesadilla instead of two, it’s just a personal preference. Step 2: Add half the cheese and melt, top with eggs and other toppings, finish with a second layer of cheese. Step 3: Fold over the quesadilla, I like to leave about 1″ border so you can see the toppings inside. And serve! Heat a large frying pan over medium-high heat. Add 1 tsp of canola oil and scramble all the eggs. Remove from pan and set aside. Add remaining oil, and first tortilla. Top half the tortilla (leaving one side empty) with 1/4 cup cheese and allow to melt for about 30 seconds. 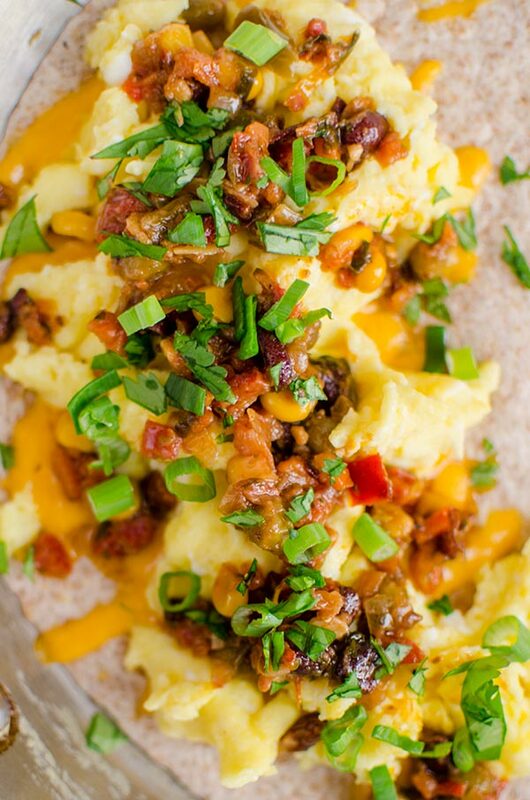 Add half the cooked eggs, top with 2 tbsp of Black Bean Miscela, one green onion and half the cilantro. Top with 1/4 cup of cheese. Fold over quesadilla, and cook for 1-2 minutes or until cheese is melted. Disclosure: This post was sponsored by Miscela – as always, all opinions are my own. Thank you for supporting my sponsors and allowing me to continue creating recipes like these breakfast quesadillas! Oh my goodness! Your Breakfast looks soooo delicious! I would make that for my breakfast, lunch or dinner! Love your photos, as well!